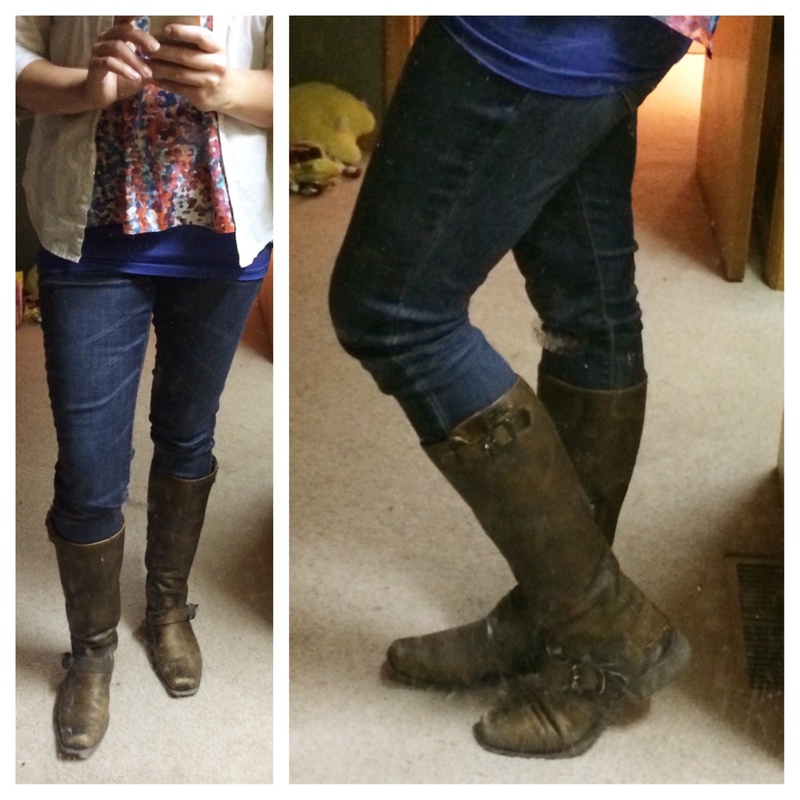 Well, I mentioned in my first Stitch Fix review that I’ve wanted a nice pair of boots for…well, forever. It is SO hard for me to buy any pieces of clothing / footwear that cost more than $10-20, so for a long time I’ve ended up with a pretty cheap wardrobe filled with ill-fitting clothing and shoes. A couple of days after that post I was reading a blog post that mentioned that 6pm.com was having a massive sale on their Frye boots (I only know about this brand thanks to The Pioneer Woman always featuring them! ), and I clicked over not thinking I’d actually buy any because they’re normally about $400+/pair, which is WAYYYYY out of my price range. 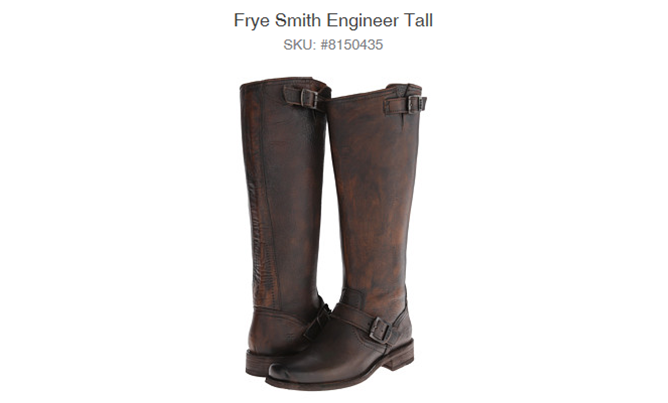 Well, this sale meant most of their Frye boots were 40% off, which is a pretty significant cost savings! After I looked around for a bit, I realized that between the sale + birthday cash from my mom + extra cash I was going to make the next night serving for a local ranch Christmas party, I could pay for the boots outright without dipping into our normal funds. Eek! I narrowed it down to four pairs: Paige, Veronica, Lynn, & Smith. Normally Jaime was my go-to fashion advice person, so instead I emailed links to my mom, sisters, MIL, and SIL. Everyone responded with Smith as their #1 or #2 choice, and when I showed them to Charlie, he also said Smith was his favorite. My blog friends all either said Lynn or Smith (and one of my sisters also said Lynn was her favorite), so I was a bit torn, but overall I think the Smiths are a little more rugged and suited to where I live / the style of clothing I wear. After a big gulp, I am SO excited to say that I pulled the trigger and finally have a nice pair of boots that Jaime would approve of that should last me for years and years! Happy 33rd birthday to MEEEE!! I wrote this post last month and totally forgot to post it because I forgot to ever snap a picture of the boots ON me. In the meantime, I was telling my good friend about these boots, and when I went to show her the boots online I saw that this particular pair was an additional $75 off less than two weeks later. She suggested emailing and asking for a refund for the price difference, and lo and behold, they did it! That means I got a pair of incredibly nice, comfortable, stylish boots for a screamin’ deal. I am VERY impressed with their customer service and will definitely be using 6pm.com again! Aww, I love the little sticky handprints. So sweet. 🙂 And the boots are beautiful! Great choice. SO cute. Nice pick. Don’t they just automatically make you feel more put-together? Ooooh girl, I love me some Fryes. I really wish I didn’t, though, because once you have a pair, you never want any other boots, ever! Those look great on you — glad you pulled the trigger. It’s important to treat ourselves every once in a while. And Fryes are so well made that you’ll have them forever. I love 6pm.com!!!! Have gotten tons of great deals!! Love them! My sister gave me a pair of nice boots a few months ago that she had bought in the wrong size, and it’s amazing how much better I feel about my clothes when I wear them. It’s really hard for me to pull the trigger on nice clothes/shoes too. Frye boots are my freaking FAVOURITE. I have *cough* two pairs and I love them. I have a pair exactly like that and I live in them over winter!